60 years of successful company history are the solid base on which we will continue to grow – both in Germany and globally. Preserving traditions does, however, not mean getting stuck with the tried and tested. As a global player, we need to constantly adjust to the ever faster changing of the world market. We are the market leader in ironing technology. This position requires a modern management style based on ethical values, the courage to tread new management paths, the development of new products and services as well as new workflows that meet the wide variety of customer requirements all over the world and that, at the same time, help to safeguard the future of our location in Germany. We strive to become the partner of choice in helping our customers maximise their quality and productivity in shaping fabrics. Together, we work towards a future that enriches people and preserves our planet. 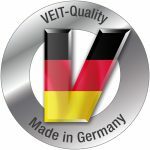 At VEIT, we design and manufacture our products in-house, because a focus on quality and innovations safeguards our future. Innovation for us means teamwork: our smartest heads work together at VEIT to find future-oriented solutions for our customers and for society. Our teams are there for you, in 18 different countries. Our sales staff look after customers all over the world. About 400 colleagues co-operate directly with our customers – every day, and around the globe. We are there for you: online, by phone, or on-site. You are looking for a Sales Partner?